Ramadan is here, greeting us with a little bit of El Nino heat and very dry temperature. I am super duper excited to meet Ramadan because no more distraction of food during the day. I can get a lot of things done during the day without any distractions. This is my go to iQuran HD app on my ipad since the begining. I think this is one of the first app I've purchased when I first got my ipad two years ago. If I'm not mistaken iQuran app is only available on ipad. 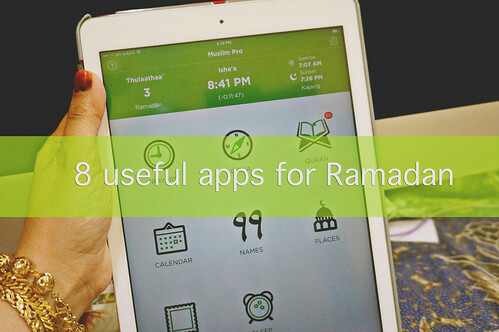 I used this app daily especially during the month of Ramadan. If I don't have the time to Tadarus with others, I used the downloadable reciter from iQuran as a Tadarus partner. It's available to me 24/7. And I also love the design. You need a good and reliable alarm clock this month so that you will not miss your Sahur, which is way early in the morning (pre-dawn period). I really need a good and beautiful alarm clock that comes with annoying sound to wake me up. - It also has a build in Quran in the app. I haven't used the build in Quran yet because I recite my Quran verses from iQuran app. - and the cool thing is it has a greeting cards build in. I have mention a lot about DayOne app and I still think it's a useful app especially during this holy month where you can use it to capture things that happened in Ramadan, your thoughts, your feelings and your life in general on the go. It can also be use to capture the food that you are eating during this month as a way to take stock of what you have been eating. Evernote is also another app that I have been raving about since two years ago. It's a versatile note taking apps that sync with all your devices. You can use this app to jot down your to do lists and goals you want to achieve this month. You can write down your groceries lists in here and you can also plan your blog content right in your Evernote. It's great place for you to plan and schedule your life a head of time because when Ramadan comes, things will move so much quicker just because there are so many things you have to do and can do only during Ramadan. everyday during the month of Ramadan? I want to share one of the biggest Islamic App like: https://play.google.com/store/apps/details?id=com.zimnix.deenwise. - Silence Zone feature turns your phone to silent when you enter in the Praying Area. It will enable the sounds when you leave the mosque! - The Whole Quran, Audio Recitation and English & Urdu Translation. - Ramadan Portal with Ramadan Duas, Calendar, Deals, Timings and Alarms for Sehr & Iftar. Prayer timing is yet another app from Deenwise with an easy to use interface, displaying daily prayer times (Fajr, Zuhr, Asr, Magrib, Isha) according the location. This modern freeware app Prayer timing can help Muslims perform daily prayers anywhere in the world in time. For Prayer times, Hanafi and Shafi methods are available in this app. You can also select a Prayer time convention accordingly. It runs in the background, automatically displaying reminders at the appropriate times each day. You can also activate/deactivate the notifications in order to be informed when it is time, so that you won’t miss any prayer.